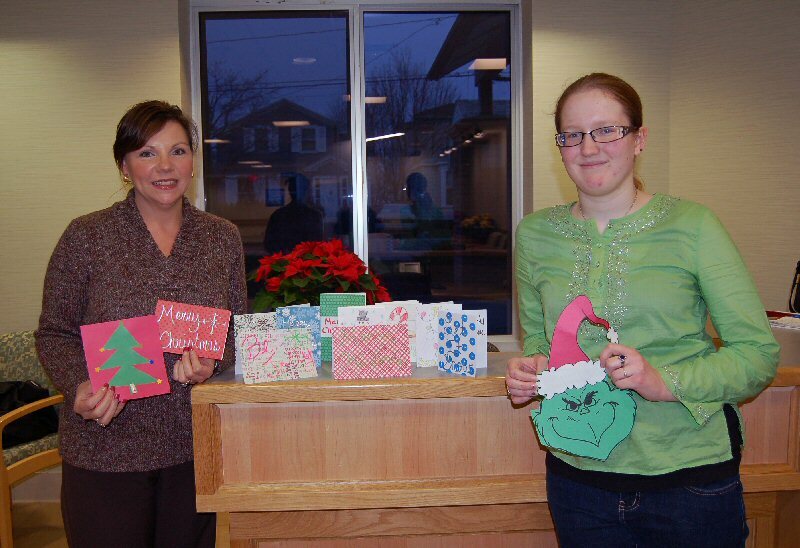 OSWEGO, NY – A group of college women were thinking of others this holiday season as they hand made more than 200 cards, which were delivered to Oswego Hospital patients. Members of the Vega Women’s Honor Society, which is open to junior and seniors from Oswego State, made the cards and brought them to the hospital several days before Christmas. In the photo from the left are Sarah Weigelt, Oswego Hospital’s director of volunteers and auxilians; along with senior Jess Tetro, an Oswego State childhood education major. The Oswego Healthcare System includes Oswego Hospital, The Manor at Seneca Hill, a skilled nursing facility, that also offers a complete rehabilitation program and an Adult Day Health Services Program; Springside at Seneca Hill, a retirement living community; and the Central Square and Fulton Medical Centers.